The UAE led the GCC with four major wins at the 'MEED Quality Awards for Projects 2014' followed by Bahrain and Saudi Arabia with three regional winners apiece. Oman and Qatar had one award-winning project each, stated MEED yesterday as it announced this year’s winners of the quality awards which are in recognition to the completed projects in the Gulf region. The award programme was held in association with Mashreq. The UAE-based projects emerged triumphant in four categories, with Abu Dhabi National Oil Company’s (Adnoc) Industrial Gas Development Project, nominated by Abu Dhabi Gas Industries (Gasco), winning "Industrial Project of the Year"; and Dubai Electricity and Water Authority’s (Dewa) Mohammed Bin Rashid Al-Maktoum Solar Park Phase 1 Project, nominated by First Solar Middle East, taking home the "Power Project of the Year" trophy. Cayan Group Real Estate Investment & Development’s Cayan Tower Project scooped the Louis Berger Building Project of the Year, while Ruwais Fertiliser Industries’ Fertil-2 Ammonia & Urea Expansion Project, nominated by Samsung Engineering, received the HLG Oil & Gas Project of the Year award. "We received a record number of entrants this year, and expected a stiffer competition from completed projects across the GCC. This is a clear affirmation that the projects industry throughout the region has regained its robustness, completing projects at a much faster pace following the slowdown in recent years," said Edmund O’ Sullivan, the chairman of MEED. Bahrain Petroleum Company’s (Bapco) Install Refinery Wastewater Treatment Plant Project received the evening’s highest honour, the 'MEED Quality Project of the Year,' in association with Mashreq award; and the Sustainable Project of the Year trophy. The Ministry of Works’ North Manama Causeway Project, nominated by Hyder Consulting Middle East Ltd, won the CH2M HILL Transport Project of the Year award. Saudi Arabia took the spotlight three times, winning awards in as many categories. King Fahad National Library’s project, nominated by Saudi Binladin Group & Gerber Architekten, scooped the 'Social Project of the Year' award, while the National Water Company’s Riyadh Water Supply Project won in the Water & Water Reuse Project of the Year category. MARS Inc.’s chocolate factory project, nominated by Hyder Consulting Middle East Ltd, won the 'Small Project of the Year' award. The Leisure and Tourism Project of the Year category was won by United Real Estate Company’s Salalah Gardens Mall and Residences Project in Oman; while Qatar’s Baytna - Qatar's First Passivhaus Project, jointly owned by Qatar Green Building Council (QGBC), Barwa Real Estate Group (BRE) and Qatar General Electricity & Water Corporation (Kahramaa), and nominated by ETA Star Engineering & Contracting, received the Award for Innovation, a category introduced only this year. "We congratulate the winners for delivering their projects to the highest quality standards and contributing to the socio-economic development of the region," stated Edmund O’ Sullivan. 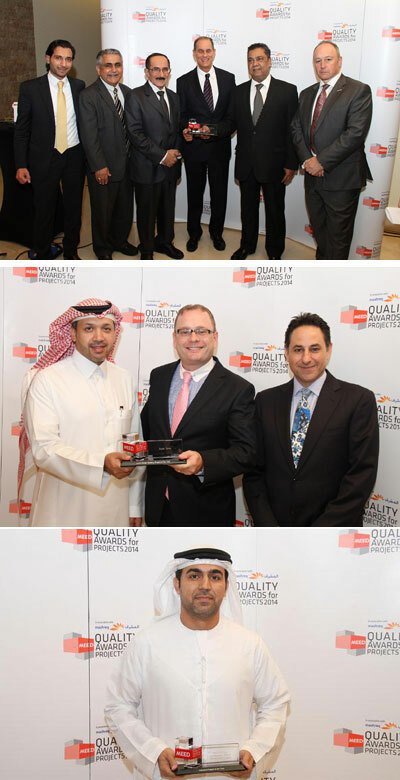 Julio Armando De Quesada, the head of Corporate and Investment Banking Group, Mashreq, lauded the winners for their commitment to executing their projects to the highest standards of quality and project excellence. "We salute the winners for their unwavering commitment to delivering their projects according to the industry’s recognised quality benchmarks and hope that others will follow their commendable example. The excellent execution of these projects ensures their intended business objectives as well as the invariable socio-economic and environmental impact that they have are optimised," noted De Quesada. "We are delighted to be a part of this recognition programme that we believe will not only benefit the projects sector, but also contribute to the progress of the GCC in the years ahead," he added. In another major highlight of the awards ceremony, MEED handed out special citations to two distinguished organisations for their contributions to the projects sector in the region. Qatar Foundation received the MEED Editor’s Award, an honour given each year to a person or organisation that stands out not only for specific achievements, but also for what it represents in terms of leadership and vision, in being a role model for the region.